The Marriott Hotel in Cardiff is one of two in the country that has been chosen to pilot a new menu which teams up with Hugh Fearnley-Whittingstall of River Cottage fame. The seasonal menu launched last month in the hotel’s Zest restaurant, celebrating local, sustainable sourcing, and will eventually – if successful – be rolled out to more locations in the Marriott chain. 80% of ingredients are sourced from within 60 miles of the venue, and the kitchen teams are trained by River Cottage staff. I really liked the idea of a hotel restaurant that uses local produce – all too often they suffer from a generic, head office enforced menu (I’m looking at you, Parc Thistle) or chefs try to put their own stamp on things but are constantly constrained by having to use centrally sourced suppliers (as I discovered from speaking to the chef at the Radisson Blu). Not all hotels have the amount of free rein that my local favourite, the Park Plaza, enjoys, so a menu that give the level of consistency that most brands would want to maintain, but at the same time gives the chef flexibility to display their own skill and at the same time use local suppliers really appealed to me. Mr W and I were invited along to try the new menu shortly after its launch. I’d not eaten in the Marriott before, and was pleasantly surprised by the restaurant which didn’t feel overwhelmingly hotel-like, although – as we were there on a weeknight – was, unfortunately, home to the usual solo diners with books, laptops and newspapers for company, so didn’t completely lose the hotel vibe. What did set it apart, however, was the service, especially from the Maitre D’, whose level of precision and professionalism would not have been out of place in a Michelin-starred venue. He, and the two waiting staff who looked after us, could not have been better, and their enthusiasm didn’t seem at all dampened by the slight lack of other diners! 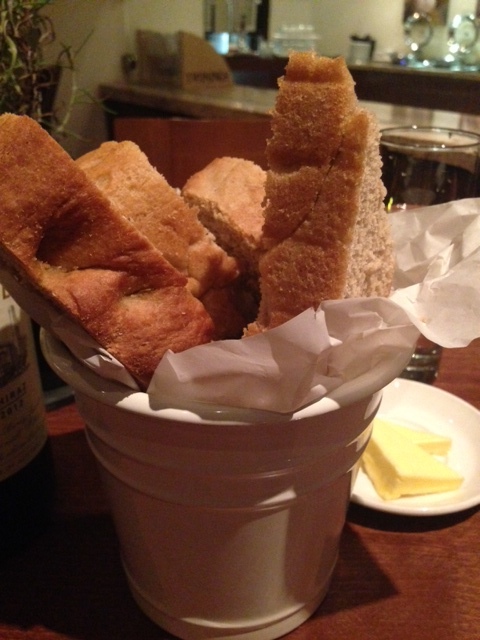 We started with some homemade focaccia, which was delicious, with a rosemary and salt crust. I could have filled up on this so had to restrain myself as I knew three courses lay ahead. 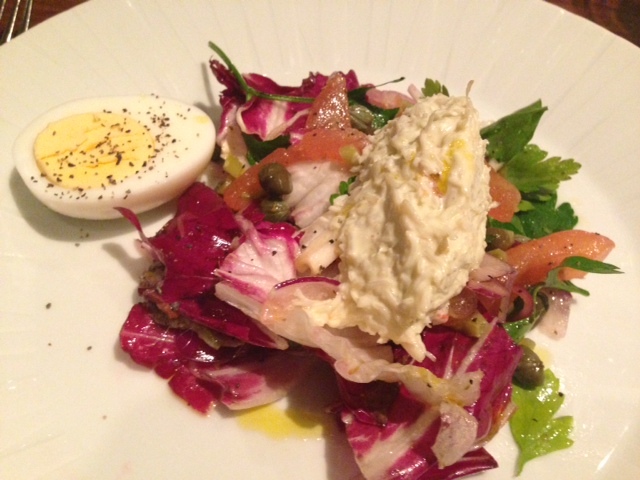 To start, I chose a parsley salad served with crab and a soft boiled egg. This sounded like a wonderfully delicate dish, but was actually quite disappointing. The crab was – as expected – delicately flavoured, but was totally overpowered by the other tastes going on on the plate. Only a small amount of parsley was in the salad, along with bitter raddichio, tomatoes and capers and a couple of anchovies were lurking in there too. Most disappointing of all was the ‘soft’ boiled egg, which – as you can see from the photo – was anything but. 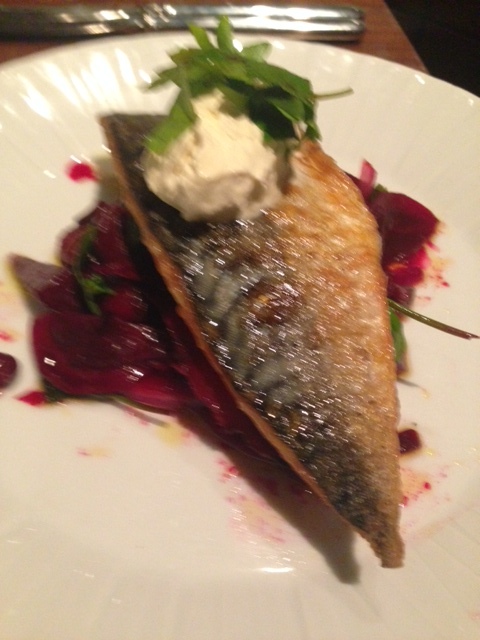 Mr W’s starter was more successful: panfried mackerel with horseradish crème fraiche and beetroot salad (please forgive the terrible blurry photo!) He really enjoyed the combination of flavours here (although there was slightly too much beetroot) and the mackerel was cooked excellently. I am currently obsessed by pulled pork, so when I saw that on offer as one of the mains, the choice for me was a no brainer. It was served with polenta, a selection of honey roasted carrots (in a range of colours!) and a salsa verde. All the flavours on the plate worked well, and the carrots and salsa were particularly good, but the pork, although quite tasty, was not as sweet and much dryer than I would have expected for pulled pork and could really have used some sauce, other than the salsa. It had been ‘reformed’ into a circle shape, which I don’t think had helped it to remain moist either. Mr W’s main of slow cooked lamb was once again more successful (it clearly wasn’t my day!) and was served with kale and smashed (sic) celeriac. This had a lot more sauce with it and was the stand out dish of the evening. 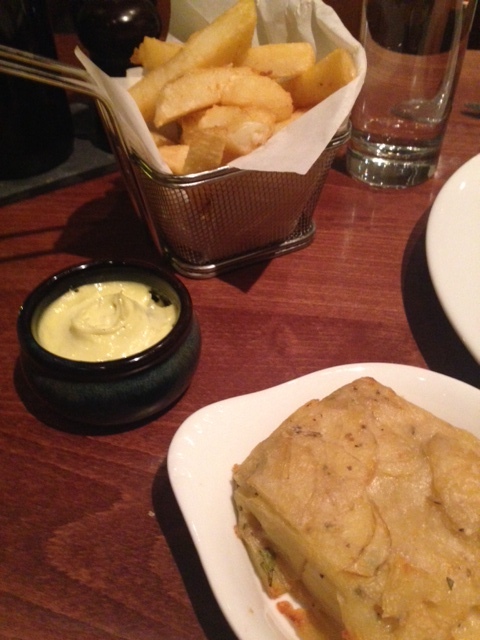 We shared sides of thick cut chips with aioli (crisp and well-seasoned) and a potato gratin with anchovies, which didn’t have whole anchovies in, but rather used them as extra flavouring. 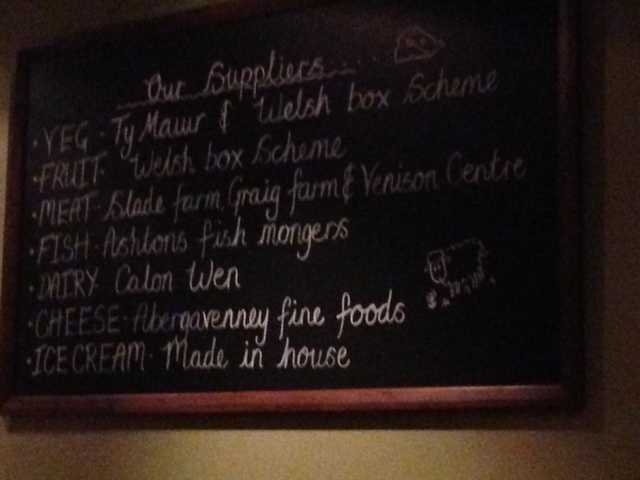 I quite liked this, but Mr W found it bland – although he likes anchovies a lot more than I do! 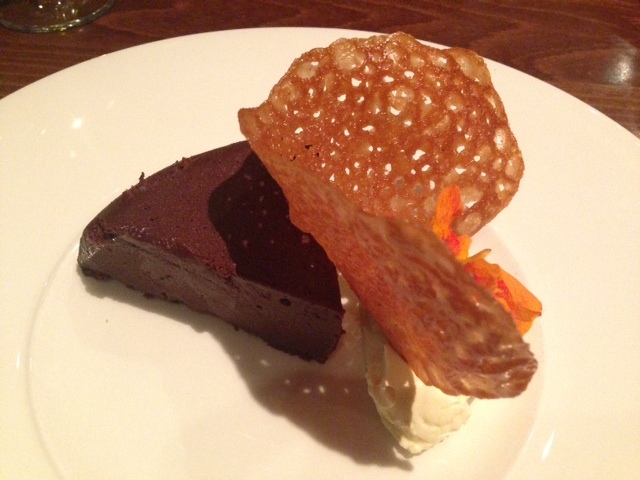 For pudding, I chose a flourless chocolate cake which was served with a brandy snap and crème fraiche (and an edible flower!) and was recommended by our waitress as her favourite. At last, my luck was in! 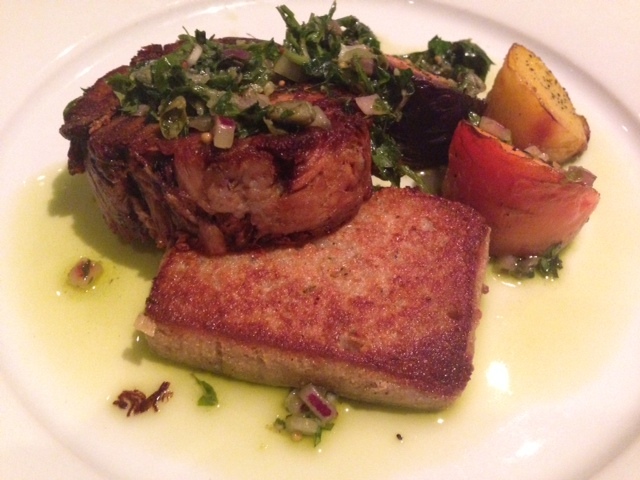 This was delicious: rich and dense without being too sickly or dry. Mr W chose an apple and apricot crumble served with custard. We’d actually heard some other diners bringing the crumble to the attention of one of the staff, as they were convinced that the apricots were in fact prunes. The staff assured them that they were definitely apricots, but just weren’t very orange as they were organic! Mr W confirmed their apricot-ness, but would have liked them to have been chopped into the fruit mixture, rather than served whole, as they had held the heat to almost volcanic temperatures which made them difficult to eat! 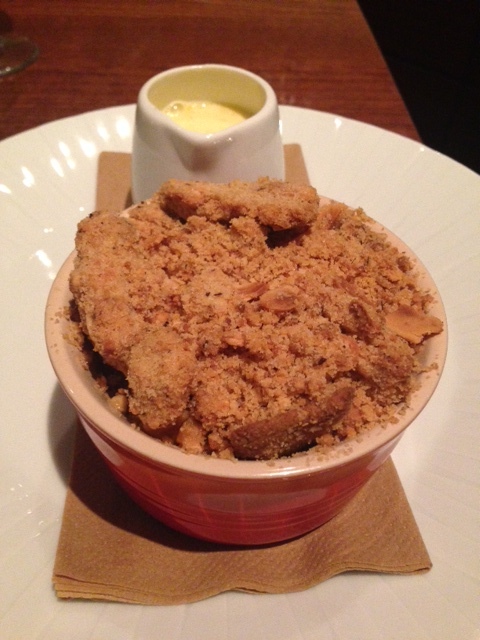 Other than that, he enjoyed the dish – the filling was sweet and the crumble crisp, complemented by the creamy custard. Our meal wasn’t perfect by any means, but I really like the concept and there was a good selection of dishes which definitely showcased some good seasonal produce. I do question whether or not it will ever be a roaring success in the Cardiff Marriott – I think it’s got too far to go to even contemplate becoming a ‘destination restaurant’ in its own right, and unfortunately its proximity too the City Centre’s multitude of chain restaurants means it doesn’t even have a captive audience – which is a great shame, as with a bit of refinement, the new menu concept, combined with the enthusiasm and talent of the team, has the potential to be excellent. 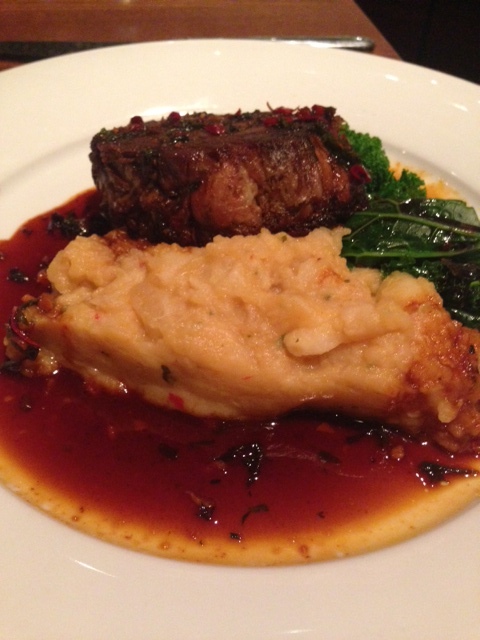 We were invited to review the new menu at the Marriott and as such our food and drinks were complementary.